This is the classic essay by Robert Greenleaf that launched the modern servant leadership movement. It is in this essay that Greenleaf coined the phrases “servant-leader” and “servant leadership,” defined the servant-leader, and discussed the importance of the characteristics of servant-leaders such as listening and understanding; acceptance and empathy; foresight; awareness; persuasion; conceptualization; self-healing; and rebuilding community. This edition of the essay includes questions for reflection and group discussion. Since its publication in the 1970s, this essay has been read by hundreds of thousands of people around the world. 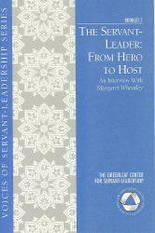 This book is a popular introduction to servant leadership. 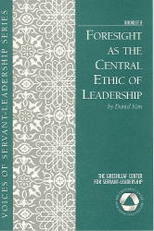 The author describes the ways in which servant leadership is ethical, practical, and meaningful. He cites the universal importance of service, defines servant leadership, compares the power model of leadership with the service model, describes some key practices of servant-leaders, and explores the meaningful lives of servant-leaders. The book includes an appendix on servant leadership compared with other ideas, a bibliography for further reading, and questions for individual reflection and group discussion. The book has been used widely by businesses, government agencies, non-profit organizations, hospitals, and more than forty universities. The author, Dr. Keith, is CEO of the Greenleaf Centre for Servant Leadership (Asia), and President Emeritus of the Greenleaf Center for Servant Leadership in the United States. DVD: What Is Servant Leadership? This 12-minute video is an introduction to servant leadership. It features short interviews with leaders in the servant leadership movement who describe the origin of the modern servant Leadership movement, the place of servant leadership in the history of ideas about leadership and management, key practices of servant-Leaders, scholarly research supporting the effectiveness of servant leadership, and a real-life example of the positive impact of servant leadership during a crisis at a brake assembly plant. 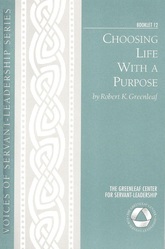 This is the classic essay by Robert K. Greenleaf that launched the modern servant leadership movement. It is in this essay that Greenleaf coined the phrases “servant-leader” and “servant leadership,” defined the servant-leader, and discussed the importance of the characteristics of servant-leaders such as listening and understanding; acceptance and empathy; foresight; awareness; persuasion; conceptualization; self-healing; and rebuilding community. This edition of the essay includes questions for reflection and group discussion. Since its publication in the 1970s, this essay has been read by hundreds of thousands of people around the world. This is Robert Greenleaf’s second major essay on servant leadership. It begins with his thesis that “if a better society is to be built, one that is more just and more loving, one that provides greater creative opportunity for its people, then the most open course is to raise both the capacity to serve and the very performance as servant of existing major institutions by new regenerative forces operating within them.” The essay calls upon trustees to care about their institutions and all the people that their institutions touch. Greenleaf challenges conventional wisdom about hierarchical organizational structures, and argues instead for a “first among equals” model with a focus on teams. This is the attractive 25th anniversary edition of Greenleaf’s first collection of essays and speeches. It includes all three of Greenleaf's essays on servant leadership- - The Servant as Leader, The Institution as Servant, and Trustees as Servants. In addition, there is a Foreword by Stephen Covey and an Afterword by Peter Senge. In this parable, Greenleaf describes the work of a university professor who cares deeply about the students of his university, and sets up a residence, known as Jefferson House, for students who are willing to commit to serving others. Mr Billings, the central figure in the parable, provides guidance as the students initiate service projects, undertake internships, and discuss the messages of visiting speakers. Much of the fable addresses issues of organizational leadership and the role of trustees in the governance of the university. Biographer Don Frick was given unfettered access to all of Greenleaf's papers and correspondence during the seven years he spent researching and writing this book, the first biography of Robert K. Greenleaf. Frick traces the sources of Greenleaf's thoughts and describes Greenleaf's friendships with dozen of well-known figures such as Eleanor Roosevelt, Aldous Huxley, Alan Watts, Peter Drucker, and many others. Frick also explains how Greenleaf influenced the course of business and lived his own life as a servant-leader. Greenleaf was a seeker, opening himself up to novel experiences and astonishing those around him. This biography is a fascinating journey through the life of one of the twentieth century's most original thinkers. The following books, essays, and DVD are publications of the Greenleaf Center for Servant Leadership in the United States and the Greenleaf Centre for Servant Leadership (Asia) in Singapore. During the past two decades, Dr. Keith has given hundreds of speeches and workshops on servant leadership. This book shares the questions that he is often asked and the answers that he gives when he is making presentations. In some cases, the answers have been expanded for this publication. This book will be especially useful to those who naturally begin with questions, whether they are new to servant leadership or have been on the journey for many years. The book provides the reader with starting points for further study, reflection, and implementation. Where applicable, answers conclude with recommendations for additional reading. A list of all the recommended readings can be found at the end of the text. In this essay, Dr. James O’Toole describes the leadership resources that Gandhi developed in South Africa that helped him to face the enormous challenges of leading India to independence. While recognizing Gandhi’s idealism, O’Toole analyses specific actions and behaviors that made Gandhi an effective leader. O’Toole argues that those actions and behaviors are appropriate and practical in a variety of leadership settings today, whether it be in business, government, or other modern organizations. O’Toole is the author of many books on leadership, ethics, and corporate culture. He is currently Daniels Distinguished Professor of Business Ethics at the University of Denver’s Daniels College of Business. The ethical behaviour of leaders has a significant impact on the ethical behaviour of others in their organizations. The poor ethical behaviour of leaders can have a negative impact on the organization’s standards, productivity, and success. One of the greatest strengths of servant leadership is its moral element. The ethical behaviour of servant-leaders is embedded in the principles that guide them in their daily decision-making. These principles, which are described in the essay, support high performance and exceptional organizational results. For servant-leaders, it is not a choice between ethics and success. It is their ethical behaviour that leads to organizational success. The author of the essay, Dr. Kent M. Keith, is CEO of the Greenleaf Centre for Servant Leadership (Asia), and President Emeritus of the Greenleaf Center for Servant Leadership in the United States. This essay by Parker J. Palmer explores the connection between spirituality and leadership. He argues that the most fundamental factors in the movement of history are not matter or materialism. The most fundamental factors are spirit, consciousness, human awareness, thought, and spirituality. He notes that leaders have a shadow side that they need to address. “Great leadership comes from people who have made that downward journey through violence and terror, who have touched the deep place where we are in community with each other, and who can help take other people to that place.” Leaders who take the inward journey know that their identity does not depend on titles, degrees, or their current role at work. As a result, they are free to give to and empower others. Palmer J. Palmer is an independent writer and teacher. He holds a Ph.D. in Sociology from the University of California at Berkeley. He is the founder and Senior Partner of the Center for Courage & Renewal, and the author of nine books, including The Active Life: A Spirituality of Work, Creativity, and Caring and Let Your Life Speak: Listening for the Voice of Vocation. This book provides a quick overview of eight medium-sized companies and the ways in which they serve their employees, customers, business partners and community partners. The final chapter outlines the characteristics of servant-institutions in business. The author, Jerry Glashagel, was a Greenleaf Center Program Consultant. Boards are responsible for guiding most institutions, whether they are public, private, or non-profit. In this essay, John Carver explains that boards should be servant-leaders to the constituencies they serve. The chairperson, meanwhile, should be servant-leader to the board. 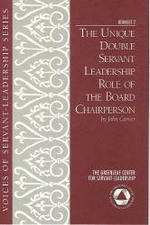 That gives the chairperson a “double servant leadership role.” John Carver is the most published author on the governing board role, having authored or co-authored three books and over 150 articles on the topic. As a creator of the Policy Governance model, he is widely considered the most provocative international authority on governance. In this thoughtful essay, Daniel H. Kim lays the groundwork for understanding foresight as the central ethic of leadership. Kim, a founding member of the Society for Organizational Learning, brings to this work his deep understanding of system dynamics as he guides the reader through the differences between forecasting, predicting, and foresight; helping actions vs. meddling actions; the relation between levels of perspective and action modes; understanding how vision and choices relate to foresight; and calling the reader to a deeper level of service to others and to self. The purpose of this essay is to examine how servant-leadership can be embodied by teachers in wide-ranging disciplines. Following Robert K. Greenleaf’s classic essay, The Servant as Leader, the authors include a discussion of building community, committing to the growth of people, foresight and conceptualization, awareness, listening and empathy, healing, persuasion, and stewardship. 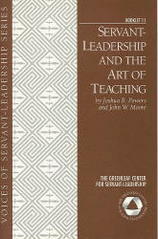 The authors provide examples of how teaching and learning can be facilitated by applying the characteristics of servant-leadership, both personally and systemically. This essay is based on a series of articles that Robert K. Greenleaf wrote for the Alcoholic Anonymous magazine, Grapevine, in 1966. Greenleaf emphasizes the importance of personal choices that can help us as individuals to deal more creatively with the world, and operate as a pervasive, constructive force in our time. He described six choices: choosing to be responsible, choosing to be aware, choosing to grow, choosing to be human, choosing to be ourselves, and choosing to be great. He urged readers to “make no little plans,” and choose the nobler belief. This essay was published for the first time in 2006. 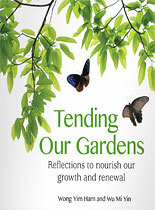 Tending Our Gardens is an invitation to tend to our own growth and well-being. The fast pace of living today exerts great demands on us to be effective in our work and personal lives. To live well in these times is not just about acquiring another skill or working faster but it is about staying centred to what we really care about. This requires us to pause to step back, reflect and respond to what we face each day, so that we can re-align to our purpose and passion. Tending Our Garden offers us a hospitable space to re-connect to what matters and to re-enter our day refreshed.